Suite 1, 19-21 Central Road, Miranda, 2228. The time frame for the treatment as proposed in this plan is 1 month. Issue: The teeth appear relatively dark in colour. This darkness is both inherent within the tooth structure and is surface stain that cannot be removed or polished away. This is further compromised by the positioning (set back) and relatively small size of your teeth and smile. Positioning – the treatment as proposed would work to artificially reposition the teeth creating a bigger, broader and more pleasing, adult smile. General Condition of the teeth – having inspected the teeth recently, it seemed that there are no cavities and that the mouth is in overall excellent condition. We would also take an x-ray (included in the fees) to verify that there are no holes/cavities. From the work completed on the models of the teeth, we will transfer these new contours to your teeth in the form of provisional restorations. These provisional restorations will serve as aesthetic and functional prototypes that will allow us to refine the ideal contours of the teeth over the following few weeks. Composite veneers are placed and shaped on the one day in a long single visit, often lasting 3 hours or more. At completion, the client will need to return for multiple follow up visits over the following few weeks, whereby we adjust the new teeth to perfectly meet your requirements regards shape and size. 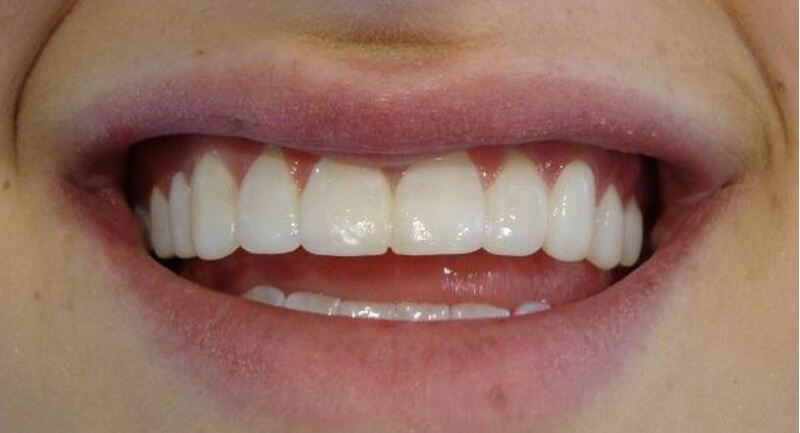 In this way we can custom make your veneers to your exact specifications. When we are both satisfied, we take photographs and issue you with a protective night splint.